4 State Trailers is your local source for Delco Trailers! Established in 2006, Delco Trailers has grown to become one of the largest, most durable lines of trailers available. 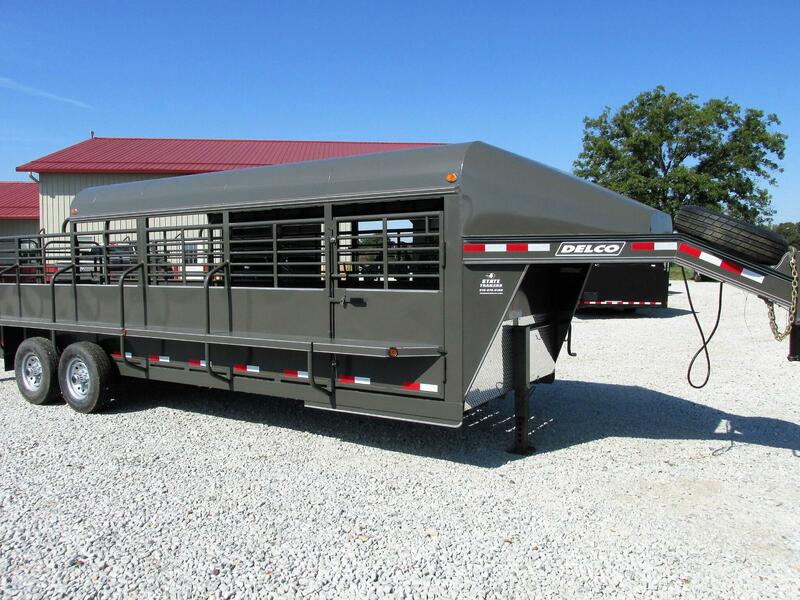 They offer a wide range of options in the horse and livestock trailers. Delco offers their Premium Livestock Trailers at the top of the line. These trailers come standard with a tapered nose, butterfly rear gates with slam latches, a ground latch coupler, slam open and closed gates, side escape door, solid sides above full length brush fenders, outside upper and lower structural bows, 1" washout along sides, heavy duty tubing structure, 3/4 metal top and rope ramps for catching. In short, these are the trailers for the real cowboy. Loaded is standard on these trailers! Next they have Bar Top/Metal Top trailers. These trailers have full length frush fenders, heavy duty structural pipe and 1"x3" tubing sides standard, and we bring all of these in with an additional 3"x5" x1/4" heavy duty angle iron frame on the outside of the 1/8" standard fender. They also have a more traditional style of stock trailer called a Combo. These come with a tapered metal nose, full metal top, standard teardrop fenders, 1"x3" tubing uprights on the sides, side escape door, and a full swing, slider rear gate. Delco offers horse trailers as well! All Delco Trailers come standard with powdercoat finish, LED lights, treated wood floors (rubber is always an option in either cleated or smooth), and torsion axles with brakes on all wheels and radial tires. Please click on the Delco logo below to visit their website!